On this day, the 16th Ohio, was on board the steamship St. Mary, struggling against a bad storm that had been battering their ship for three days. 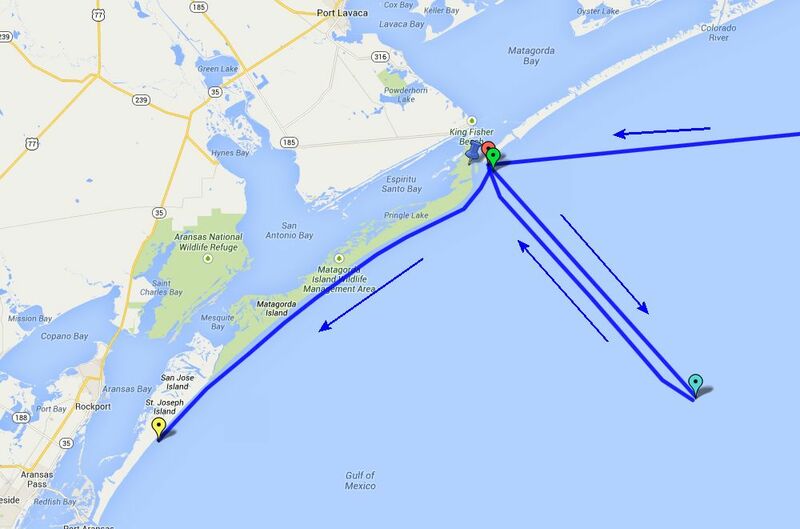 The ship had been anchored just off Decros Point at Matagorda Peninsula, Texas, since the evening of November 27. The three-day storm intensified throughout the Previous day and forced the ship about 32 miles out to sea, dragging its anchor along the way. About 1:00am, the Captain decided to raise anchor, with the required assistance of some reluctant 16th Ohio soldiers, and make its way back to the coast. The St. Mary arrived at its original anchorage off Decros Point about dawn. As the day progressed, the sun appeared and it got warmer. It is assumed the commanders on board the St. Mary, having now returned to the coast and able to communicate with other Union commanders in the area, received orders to move further west, along St. Joseph's Island, and land their troops there. The plan was for the 16th Ohio and 69th Indiana, on board the St. Mary, to land, join other troops already on the island, and move east to attack Confederate-held Fort Esperanza, situated on the east side of Pass Cavallo (opposite Decros Point) and which was guarding the pass against entry by Union ships. At some point on this Sunday morning, the St. Mary left Decros Point and moved 45 miles southwest to a point along St. Joseph Island. The troops would be landed the next day. Detailed 1984 nautical map showing the approximate route of the 16th Ohio on board the steamship St. Mary on what must have been a very long day, November 29, 1863. Modern day map showing the approximate route of the 16th Ohio on November 29, 1863, having been blown out to see by a fierce storm the day before, returning to its original anchorage off Decros Point, Matagorda Peninsula, Texas, and then moving southwest to a landing point on St. Joseph Island. Green pin - Approximate location of the 16th Ohio on the morning of November 29, 1863, back at its anchorage off Decros Point, Matagorda Peninsula, Texas, after returning from far out at sea where it was blown the night before. 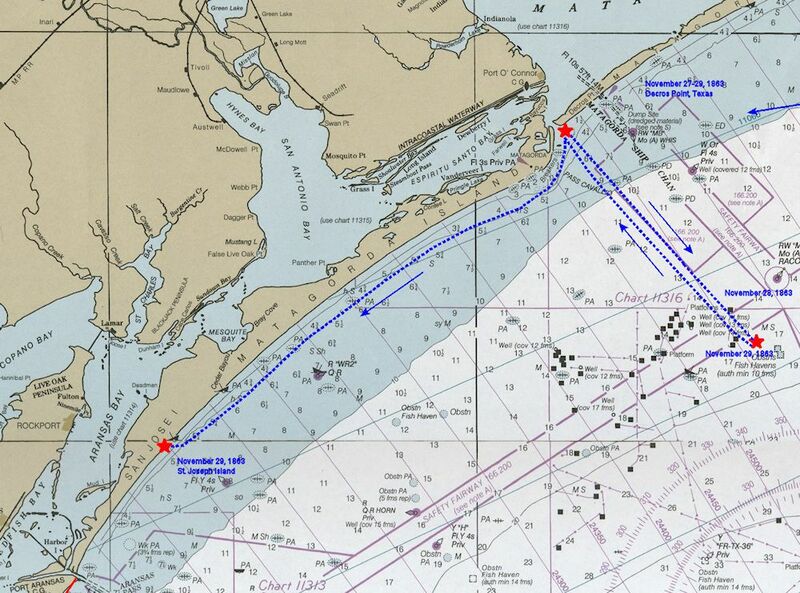 Yellow pin - Approximate location of the 16th Ohio later on November 29, 1863, off St. Joseph Island, Texas, where it was to land the troops on the island the next day. Blue pushpin - Approximate location of Fort Esperanza, held by the Confederates on this day.